Are Layoffs In New York City Racially Motivated? | Virginia Right! A story in the New York Times published July 13, 2009 notes that black are losing their jobs at 4 times the rate of whites. Unemployment among non-Hispanic whites is around 8% and among blacks is 15%. The story points out that there is a disparity nationwide between whites and blacks, but New York has one of the largest gaps in the country. One can only assume that this is all Sonia Sotomayor, nominee for the Supreme Court would need to order a remedy immediately, as an obvious case of racial discrimination because of the outcome, which seems to be the same conclusion the New York Times reached. But looking at the fact that they only interviewed two unemployed black workers, one of whom quit his Home Depot job because he was not making enough to pay his bills, and also a lobbyist for low income workers and the chief economist for what they call a “liberal research group”, the Times once again proves that “investigative journalism” is a subjective thing. Patrick McGeehan, the award winning reporter who wrote this story has a background in hard hitting journalism. Unfortunately, his stories tend to encompass Doughnuts, Cookies and bakeries. You get hungry doing such intense digging. Ahmadi Scruggs, 32, said he was dismissed in April from his job in customer service at a New York bank that cut its payroll after many of the mortgages it made went sour. Mr. Scruggs, who is black and lives in Soundview, in the Bronx, said he did not think that the layoff, which followed a hiring freeze, was racially motivated, but said that it appeared to have a disparate effect on whites and minority workers. While Scruggs does not see it as “racially motivated”, he really kinda does. They kept the “mostly white” supervisors. Economists said they were not certain why so many more blacks were losing their jobs in New York, especially when a large share of the layoffs in the city have been in fields where they are not well represented, like finance and professional services. But in those sectors, the economists suggested that blacks may have had less seniority when layoffs occurred. And black workers hold an outsize share of the jobs in retailing and other service industries that have been shrinking as consumers curtail their spending. Well, could it be that the greedy, evil, “mostly white” professionals that were laid off were actually buying things from the retail and service industry businesses that are now shrinking? You know, spreading the wealth around? Without government intervention? Sort of like, I don’t know, trickle down economics? And why was there no mention of the New York City Minority and Women-Owned Business Enterprise (M/WBE) Program Mayor David N. Dinkins put in place in 1992, the Emerging Business Enterprise (EBE) Program and the Locally-based Business Enterprise (LBE) Program that certify, promote, and foster the growth of the City’s minority and women-owned businesses and eligible small construction and construction-related businesses? These programs have made it their mission to promote minority owned businesses and essentially set quotas, now called “goals” which must be met. A whole industry has grown up around these programs to take advantage of government giveaways. It is mandatory to steer as many projects as possible to businesses that have the right “racial” element. Ofter, lower bids and higher quality jobs and materials must be turned down due to the race of the business owner. Minority business owners are not stupid. They realize that on a playing field slanted to their advantage, they can win a bid with higher costs and lesser quality, which maximizes profits. No one can blame them. If it’s allowed by the city, why not? So what becomes of the construction workers, the caterers, and all the others that have taken advantage of these programs when the city runs out of money? Well, they are simply out of work. Unemployed. The “stimulus” money from the Federal government has it’s own set of rules that are not as favorable to the minority owned businesses as the City rules. Not to mention that most of that money has yet to be spent. So, as you can see, the Law of Unintended Consequences has struck again. This is a case of the government trying to force an outcome for the benefit of people that have suffered from past discrimination. Few would say this was not a necessary and admirable remedy. But the unfairness in the awarding of contracts has created a boom in minority owned businesses employing millions of minorities with what amounts to guaranteed government contracts. It also tells these businesses that they can not compete on a level playing field, which is absolutely absurd. So, in the end, New York City can thank it’s anti-discrimination laws for the disproportionate loss of minority jobs. These laws have attracted, by design, a large number of minorities to easy money. A program that set out to enforce fairness has actually created a huge dependent class of businesses. And now that the City is in severe financial difficulty, money is hard to come by. As are minority contracts. 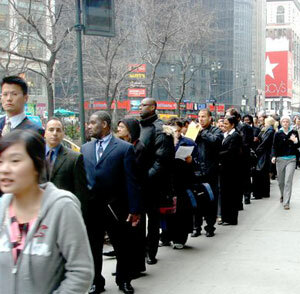 Many of the non minority contractors have been forced to diversify, increase their customer base to non government sources and not count on contracts with race requirements, where many of the minority owned businesses found plenty of contracts that were easy to obtain under these laws and programs and have no customers outside of the City programs. But the real story seems at odds with McGeehan’s sense of political correctness and what his editors want. But the fact is, Political Correctness, Diversity, and Quotas have run head on into the cold hard reality that is an economic recession. It seems the two are not mutually compatible after all. ← Eastern Shore Defend & Declare Rally Wednesday, July 22, 2009 5 p.m. to 7 p.m. I would like to start off by saying, thank you for supplying me with the information I’ve been looking for. I’ve been surfing the net for two hours looking for it and would have given my right arm if I would have located your website sooner. Not only did I find what I was searching for, but also found answers to questions I never thought to ask myself. Thank you for such a wonderful web-site!